And it's true. Exaggerated and made-up silly articles and headlines about Michael Fassbender are much more interesting to the masses instead of normal headlines about a normal guy. Michael is not a wild guy in the public eye, and I've been following his career for 7 years. While he's not a choir boy, (what 37 year old actor is? ), he's certainly not as wild as people want him to be, or are gullible to believe him to be. I've always like reading interviews like this because Michael is straightforward, honest, and is precise in how he responds. 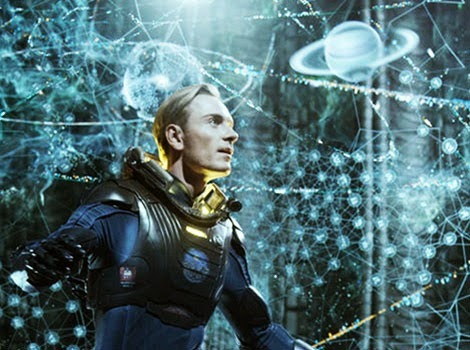 Prometheus - His David was smooth, menacing, calculating and the most interesting Earthling of all the characters in Prometheus. Centurion - As Quintas Dias, Michael's performance in this little seen historical drama of a Roman soldier in ancient Great Britain is brutal, bloody, and depicting bravery in a manner that really makes you empathize with Dias and root for him in the very beginning. Inglorious Basterds - As Archie Hicox, Michael as the faux German soldier stole the show in the tavern scene. He was out of his league but they almost made it until he used the wrong three fingers. Doh! The change in his mood, his demeanor, and switching from German to British was smooth as his final taste of scotch. Shame - Michael should have received his first Oscar nomination and won! That's all I'm going to say dammit (yes, I'm still mad about his snub). 12 Years a Slave - No other actor could have done for Epps what Fassbender did for Epps. Bringing to life a very, very pathetic, vile, and angry man who enjoyed torturing his slaves. The character was so bad, but Michael's performance so extraordinary, that his "prize" was just to be nominated for an Oscar as politics could not actually allow him to win it. What do you think are Michael's five greatest roles? I thought of you when I read the 'normal guy' comment. And we both know that's why we like him so. He focuses on the acting and storytelling, not the BS of being famous and rich. Although having said that, he's so good to his fans--signing autographs and taking pictures. Did you just love his comment about the champagne? "That's just being civilized!" LOL Too true. About the champagne, that's also just being posh. Fassy's got style! I always thought about his fame in being a Hollywood wild man... Really, I can't stand this view of a "predator" that people insisting. He doesn't do anything different from a normal, single guy of his age. Just because he's an actor he's a "wild man"? Is it a sin likes parties? Having fun? I like interviews like this, where he's so honest and straight to the point, and people can have an impression totally different from what they were expecting. And just a last point: it's interesting to see that the people who say the most horrible things about him, NEVER HAVE met him. About the roles, David is one of my favourites! He's cute and creepy at the same time. (I see the connection with the Pandora's box myth) I was really impressed with his acting on the movie, and he was the most interesting character so far. European gentleman, as you said. I like Brandon, Erik, and I'm going to guess Frank best (haven't seen it, but I'm excited about seeing him do comedy). I'd like to see him play a family man or at least a devoted hubby in a movie someday too. Takhesis, the people who say the most horrible things about him, simply do not like him, let alone are they fans. That's where FF comes into play in helping to showcase and maintain Michael's well-reported likability and respect from the industry, peers, and friends. Michael is truly a multi-faceted actor, showing his great talent as much in blockbusters than in independent cinema. I think it shows an amazing force of personality in the films he made with Steve McQueen even though his characters are completely different. I like him in the role of Erik, too, and I have a little crush because it is thanks to the Xmen I discovered Michael. My Top 5 would be Hunger, Shame, TYAS, The Dangerous Method and Prometheus. Cannot really rate the three McQueen masterpieces, for me these are very close. Damn, I feel stupid...I over looked Jane Eyre with Fassy as Rochester, it's my default Fassy film when I need to Look/Listen to him. and just to add another feel good film "A Bear Called Winnie"